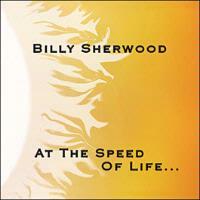 Billy Sherwood has released this solo album and it is truly a solo work. He wrote all the songs and performs every bit of music on the disc. Much of this album reminds me of Open Your Eyes by Yes (an album on which Sherwood was a member of the band). I suppose that tells you how much he had to do with that album’s songwriting. This is accessible yet considerably impressive progressive rock. It’s vocal dominated, but the bass guitar is also a star player. There are really no weak points (well, some guitar soloing in the first track leaves me a bit under impressed) and a very strong release. I like it a lot and it will probably make my list of best albums of 2008. 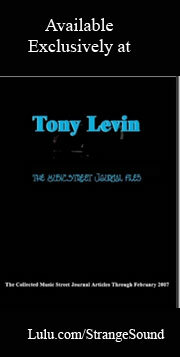 This rises gradually and then a bass line that calls to mind Tormato era Squire enters. The arrangement fills out and we are taken on a new prog rock journey that’s got a lot in common with Open Your Eyes era Yes. Both the vocal and instrumental arrangements are quite complex and yet they never lose the listener. I hear some definite Beatles-like sounds at points along this journey. There is a cool, nearly funky, jam, too. The guitar solo segment that serves as the outro loses me just a bit at times, seeming to wander towards “noodleism” at points. This one’s a bit slower, but it’s definitely in a mode that calls to mind OYE era Yes. I really like the vocal arrangement on this one and several of the changes are just plain killer. There a couple intriguing extended instrumental segments. The first of these features a dynamic arrangement and some guitar work that’s so Steve Howe-like that it’s almost scary. The second one seems more free form and rather like mellower fusion. In an intriguing change of pace, Sherwood gives us a bass heavy instrumental that has more in common with fusion and the music of Joe Satriani and Steve Vai than it does with any era of Yes. This is a rather moody piece, but also quite pretty. Beginning with atmospheric sounds, a sharp keyboard element that calls to mind early Starcastle joins quickly. The wall of vocals joins and this moves gradually in a slow atmospheric pattern. It shifts out into a more “song” like structure after this extended introduction and then we move out into a series of alterations and manifestations. This again has some of that Tormato sounding bass. It feels rather like OYE, too, but also has some Beatles-like tendencies and some seriously crunchy guitar. This is more accessible than some of the other music here, but nowhere near what you’d call “pop.” This is quite a dynamic piece, moving through several changes, but it always feels organic and natural. This one comes in moody and atmospheric. The vocals and textural instrumentation merge to create something that reminds me of a cross between Pink Floyd and Fish. It stays in this understated motif for about two minutes and then gradually shifts out into a slow moving but more potent jam that again makes me think a bit of Satriani. The bass guitar that drives much of this, though, is definitely more in keeping with Chris Squire. We get some Pink Floyd-like guitar soloing at times. Sherwood brings this one in with understated elements. It moves out gradually into a rocking jam that’s still got a bit of that OYE era Yes sound. This is worked through a number of interesting changes and alterations. There is this great running / soaring bass segment later in the track that definitely reminds me a lot of something Chris Squire would create. An instrumental segment later reminds me at first of Tormato era Yes a lot. Then it shifts towards more Pink Floyd like sounds. These two elements seem to merge after a while. This is a powerful cut that starts off in fairly atmospheric and moody ways. It grows out into a slow moving, but potent progressive rock jam that again has a lot in common with Open Your Eyes from Yes. Actually, this is quite a dynamic cut and it makes its way through a number of intriguing changes. There is a section later (the one that eventually ends it) that even reminds me quite a bit of The Buggles. It’s one of my favorite tracks on the disc and a great way to end things.